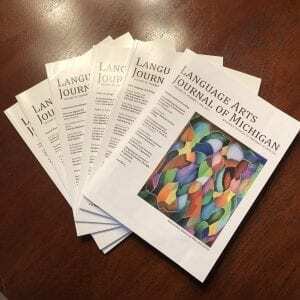 The Language Arts Journal of Michigan is published twice a year. Archived issues from 1985 to the present are available at Scholarworks. The College, Career, and Community Writing Program (C3WP) is National Writing Project’s new and innovative argument writing program that answers the urgent and contemporary call for respectful civic engagement and discourse. The program is based upon cycles of writing that take place four times a year and include the following unique features: routine argument writing; skills-based mini-units emphasizing the use of current nonfiction sources; the recursive writing of thesis statements that emerge and evolve as students read over time; multiple perspectives beyond pro/con; embedded, teacher-driven formative assessment; and teacher professional development. To learn more about the College, Career, and Community Writing Program, see Friedrich, Bear, and Fox’s “For the Sake of Argument: An Approach to Teaching Evidence-Based Writing” at https://www.aft.org/ae/spring2018/friedrich_bear_fox or visit the C3WP homepage at https://sites.google.com/nwp.org/c3wp. For questions regarding manuscript submissions, please contact Elizabeth Brockman at [email protected]. Click below for the latest issue of the MET — July 2018. Access past issues of the MET here.